Nothing says ‘celebration’ more than a spectacular firework display and is there any better way to end your wedding day? With over 50 years’ experience of providing firework displays, Kimbolton Fireworks can offer peace of mind regarding all aspects of your display to ensure it really is a safe and perfect end to a perfect day. 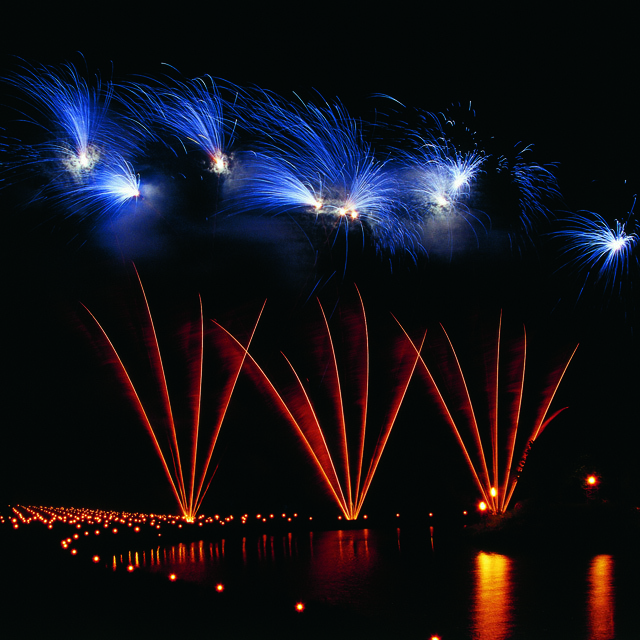 As the only manufacturer of Display Fireworks in the UK, we supplement our own range of in-house manufactured fireworks with high quality material sourced from Europe and the Far East. We offer a bespoke service from start to finish and undertake all aspects of the planning so that you can focus on other aspects of planning the big day. The display can be tailored to match a colour scheme or theme of your choice. For those who love their music and have a slightly larger budget, the inclusion of your own songs into the display with perfect split-second choreography can be provided with breathtaking results. Wedding Displays can be created to suit a variety of budgets to make your day extra special. A truly memorable professional display can be delivered for as little as £1,500. We don’t offer standard packages as some companies do; we believe that every display should be designed specifically to suit each customer’s expectations and provide a unique memory. Does your chosen venue allow fireworks? Many established wedding venues do allow fireworks and are quite used to them. Before proceeding with any firework plans it is best to ask the question if they are allowed at your venue first. Some venues do not allow fireworks mostly due to complaints about the noise from nearby neighbours. We are happy to design displays with low noise in mind if the venue has such concerns. Does your chosen venue have a suitable ‘site’ for holding a professional firework display? If your venue does allow fireworks then the answer to this is probably yes. Let us liaise with the venue and conduct a site visit and produce a site specific risk assessment to ascertain what type and size of effects will be suitable to safely use. With the responsible and experienced selection of suitable fireworks it is possible to deliver something spectacular at almost any location. If your chosen venue is ambivalent to the idea of fireworks let us talk to them and put their minds at rest with respect to the finer points of H&S, Insurance and protecting their beautiful property and grounds. We have a great reputation and are very used to performing displays from sensitive, high-profile and delicate locations. If your display is in the summer months it does not get dark until much later, of course. It may only be dark enough to gain the full impact of the display at 22:30. It is a requirement by law that the display is finished by 23:00 on nearly all occasions. Such concerns are not an issue in the winter months but the wellbeing of your family and friends should be considered with respect to inclement conditions – a shorter, more intense display may be a good idea. The length of the display should not always be dictated by budget. The width, style and intensity of the display should be considered with the budget in mind but the duration of the display should be chosen beforehand. It is our vast experiences that the optimal duration for a display is in the region of 12-15 minutes. Most of the larger global spectacles such as London, Dubai and Sydney on New Year’s Eve are only in the region of 7 – 15 minutes duration. A show much longer than this tends to see certain members of the audience losing focus despite the aural and visual bombardment occurring in front of them. Typically, a wedding display should cater for all types of audience members, from the very youngest child to the oldest relative with respect to the type of firework effects used. We would recommend using traditional types and colours of effects that are intended to be more about the visual rather than aural sensation. However, it’s the Bride and Groom’s big day and if noise is desired then so be it! The width of the display is an important factor and the display should be as wide as the site and budget allow – the more of the sky that is able to be utilised creates a much higher impact – particularly when the display is fired electronically to music. How Much Will A Display Cost? The cost of a professional firework display can vary tremendously due to its location, venue constraints, customer expectation and budget. We do not have standard packages as most companies do; we believe your special day deserves more consideration. Every display is bespoke so please contact our display team to discuss the possibilities and we will provide a free no-obligation quotation. There are no hidden costs whatsoever; from design to delivery and all of the red-tape in between ! Kimbolton Fireworks specialise in firework performances that are digitally choreographed to music. Tightly synchronising fireworks to music can really have an amazing impact and allows us to really exhibit our knowledge and experience in an unforgettable way. If you provide us with titles of your favourite songs we will be able to create a digital simulation and demonstrate what the display will look like before the big day, however, most prefer a surprise! Using our digital firing systems we are able to safely synchronise the fireworks to music within hundredths of a second. How Will The Weather Affect The Display? A warm evening with a gentle breeze would be a fantastic scenario for you, your guests and the fireworks. A gentle breeze blowing away from the audience is the most desirable. We all appreciate that the weather in the UK can be unpredictable and must accept this fact and mitigate for the unfortunate scenario of rain and high wind. Rain will never usually cause a display to be cancelled. All of our fireworks and ancillary equipment are able to be made waterproof. High winds can be a factor that cause the display to be cancelled from a Health & Safety perspective. Fireworks drifting drastically towards people or structures is a factor that must be taken very seriously. Adverse wind conditions of a moderate nature can be overcome with slight modification of the show – i.e. remove the long-burning larger fireworks that pose a risk. There are wind speed thresholds and wind directions which cannot be safely overcome on certain (smaller) sites and it is primarily this variable which can cause a display to be cancelled / postponed. These factors are always clearly documented in Risk Assessments and are shown in our Terms and Conditions. At Kimbolton Fireworks we all love what we do and enjoy talking about fireworks. If there are any questions you may have then please do not hesitate to contact a member of our display team who will be pleased to help.